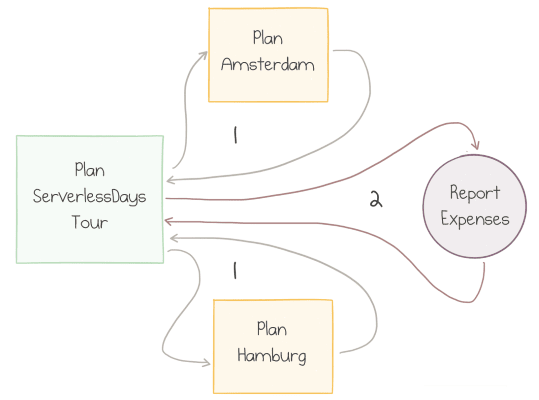 Stateful Workflows on top of Stateless Serverless Cloud Functions—this is the essence of the Azure Durable Functions library. That's a lot of fancy words in one sentence, and they might be hard for the majority of readers to understand. Explain the solutions that Durable Functions offer for those problems. Usually, the modules would be packaged together at build time and then deployed as a single unit, so a lot of communication between modules would stay inside the OS process. 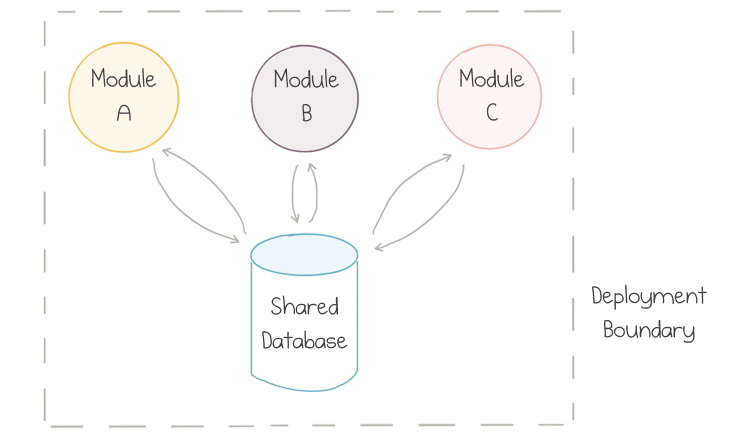 Although the modules could stay loosely coupled over time, the coupling almost always occurred on the level of the data store because all teams would use a single centralized database. This model works great for small- to medium-size applications, but it turns out that teams start getting in each other's way as the application grows since synchronization of contributions takes more and more effort. Each team then owns a whole vertical—from public communication contracts, or even UIs, down to the data storage. Explicitly shared databases are strongly discouraged. 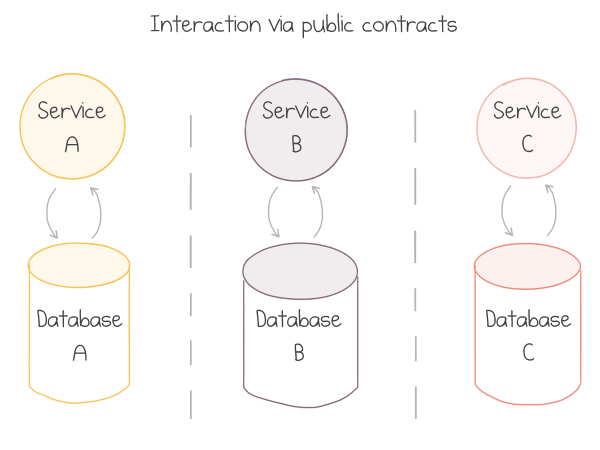 Services talk to each other via documented and versioned public contracts. If the borders for the split were selected well—and that's the most tricky part—the contracts stay stable over time, and thin enough to avoid too much chattiness. This gives each team enough autonomy to innovate at their best pace and to make independent technical decisions. Networks are fundamentally unreliable: they work just fine most of the time, but when they fail, they fail in all kinds of unpredictable and least desirable manners. There are books written on the topic of distributed systems architecture. TL;DR: it's hard. A lot of the new adopters of microservices tend to ignore such complications. 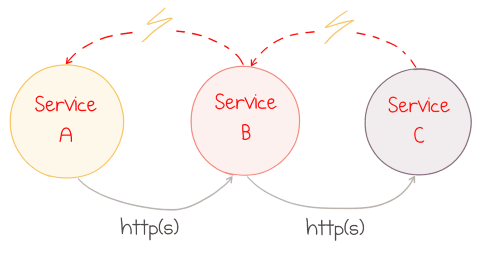 REST over HTTP(S) is the dominant style of connecting microservices. Like any other synchronous communication protocol, it makes the system brittle. The application is down. Everybody screams and starts the blame war. While cascading failures of HTTP communication can be mitigated with patterns like a circuit breaker and graceful degradation, a better solution is to switch to the asynchronous style of communication as the default. Some kind of persistent queueing service is used as an intermediary. The service that produces events might not know about the consumers. New event subscribers can be introduced over time. This works better in theory than in practice, but the services tend to get coupled less. 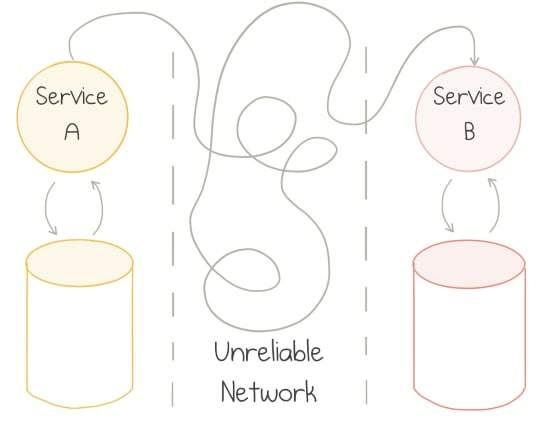 More importantly, if one service is down, other services don't catch fire immediately. The upstream services keep publishing the events, which build up in the queue but can be stored safely for hours or days. The downstream services might not be doing anything useful for this particular flow, but it can stay healthy otherwise. It's very easy to make nicely decoupled systems with event notification, without realizing that you're losing sight of the larger-scale flow. Given many components that publish and subscribe to a large number of event types, it's easy to stop seeing the forest for the trees. Combinations of events usually constitute gradual workflows executed in time. A workflow is more than the sum of its parts, and understanding of the high-level flow is paramount to controlling the system behavior. Hold this thought for a minute; we'll get back to it later. Now it's time to talk cloud. The birth of public cloud changed the way we architect applications. It made many things much more straightforward: provisioning of new resources in minutes instead of months, scaling elastically based on demand, and resiliency and disaster recovery at the global scale. There are good reasons to deploy applications to more than one geographical location: among others, to reduce network latency by staying close to the customer, and to achieve resilience through geographical redundancy. Public Cloud is the ultimate distributed system. As you remember, distributed systems are hard. There's more to that. Each cloud provider has dozens and dozens of managed services, which is the curse and the blessing. Specialized services are great to provide off-the-shelf solutions to common complex problems. On the flip side, each service has distinct properties regarding consistency, resiliency and fault tolerance. In my opinion, at this point developers have to embrace the public cloud and apply the distributed system design on top of it. If you agree, there is an excellent way to approach it. The slightly provocative term serverless is used to describe cloud services that do not require provisioning of VMs, instances, workers, or any other fixed capacity to run custom applications on top of them. Resources are allocated dynamically and transparently, and the cost is based on their actual consumption, rather than on pre-purchased capacity. Serverless is more about operational and economical properties of the system than about the technology per se. Servers do exist, but they are someone else's concern. You don't manage the uptime of serverless applications: the cloud provider does. On top of that, you pay for what you use, similar to the consumption of other commodity resources like electricity. Instead of buying a generator to power up your house, you just purchase energy from the power company. You lose some control (e.g., no way to select the voltage), but this is fine in most cases. The great benefit is no need to buy and maintain the hardware. Serverless compute does the same: it supplies standard services on a pay-per-use basis. If we talk more specifically about Function-as-a-Service offerings like Azure Functions, they provide a standard model to run small pieces of code in the cloud. You zip up the code or binaries and send it to Azure; Microsoft takes care of all the hardware and software required to run it. The infrastructure automatically scales up or down based on demand, and you pay per request, CPU time and memory that the application consumed. No usage—no bill. Stateless: as you don't control where and when function instances are provisioned or deprovisioned, there is no way to store data within the process between requests reliably; external storage has to be utilized. Frankly speaking, the majority of existing applications don't really fit into this model. If you are lucky to work on a new application (or a new module of it), you are in better shape. There are 9 managed Azure services working together in this app. Most of them have a unique purpose, but the services are all glued together with Azure Functions. An image is uploaded to Blob Storage, an Azure Function calls Vision API to recognize the license plate and send the result to Event Grid, another Azure Function puts that event to Cosmos DB, and so on. This style of cloud applications is sometimes referred to as Serviceful to emphasize the heavy usage of managed services "glued" together by serverless functions. Creating a comparable application without any managed services would be a much harder task, even more so, if the application has to run at scale. Moreover, there's no way to keep the pay-as-you-go pricing model in the self-service world. in enterprise applications are often much more sophisticated. Remember the quote from Martin Fowler about losing sight of the large-scale flow. That was true for microservices, but it's even more true for the "nanoservices" of cloud functions. I want to dive deeper and give you several examples of related problems. For the rest of the article, I'll define an imaginary business application for booking trips to software conferences. In order to go to a conference, I need to buy tickets to the conference itself, purchase the flights, and book a room at a hotel. This approach works, however, problems do exist. As we need to execute the whole booking process in sequence, the Azure Functions are wired one after another by configuring the output of one function to match with the event source of the downstream function. In the picture above, the functions' sequence is hard-defined. If we were to swap the order of booking the flights and reserving the hotel, that would require a code change—at least of the input/output wiring definitions, but probably also the functions' parameter types. In this case, are the functions really decoupled? What happens if the Book Flight function becomes unhealthy, perhaps due to the outage of the third-party flight-booking service? Well, that's why we use asynchronous messaging:after the function execution fails, the message returns to the queue and is picked up again by another execution. However, such retries happen almost immediately for most event sources. This might not be what we want: an exponential back-off policy could be a smarter idea. At this point, the retry logic becomes stateful: the next attempt should "know" the history of previous attempts to make a decision about retry timing. There are more advanced error-handling patterns too. If executions failures are not intermittent, we may decide to cancel the whole process and run compensating actions against the already completed steps. This scenario is not trivial to implement with stateless functions. We could wait until a message goes to the dead-letter queue and then route it from there, but this is brittle and not expressive enough. Sometimes the business process doesn't have to be sequential. In our reservation scenario, there might be no difference whether we book a flight before a hotel or vice versa. It could be desirable to run those actions in parallel. Parallel execution of actions is easy with the pub-sub capabilities of an event bus: both functions should subscribe to the same event and act on it independently. There is no way to implement the Report Expenses block as a single Azure Function: functions can't be triggered by two events, let alone correlate two related events. The solution would probably include two functions, one per event, and the shared storage between them to pass information about the first completed booking to the one who completes last. All this wiring has to be implemented in custom code. The complexity grows if more than two functions need to run in parallel. Also, don't forget the edge cases. What if one of the function fails? How do you make sure there is no race condition when writing and reading to/from the shared storage? All these examples give us a hint that we need an additional tool to organize low-level single-purpose independent functions into high-level workflows. Such a tool can be called an Orchestrator because its sole mission is to delegate work to stateless actions while maintaining the big picture and history of the flow. Azure Durable Functions aims to provide such a tool. 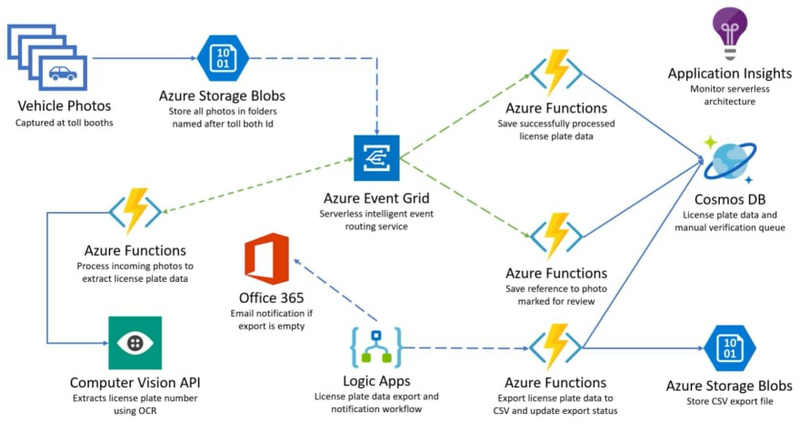 Azure Functions is the serverless compute service from Microsoft. Functions are event-driven: each function defines a trigger—the exact definition of the event source, for instance, the name of a storage queue. The FunctionName attribute exposes the C# static method as an Azure Function named MyFirstFunction. The QueueTrigger attribute defines the name of the storage queue to listen to. The function body logs the information about the incoming message. Durable Functions is a library that brings workflow orchestration abstractions to Azure Functions. It introduces a number of idioms and tools to define stateful, potentially long-running operations, and manages a lot of mechanics of reliable communication and state management behind the scenes. The library records the history of all actions in Azure Storage services, enabling durability and resilience to failures. Durable Functions is open source, Microsoft accepts external contributions, and the community is quite active. Workflow building functionality is achieved by the introduction of two additional types of triggers: Activity Functions and Orchestrator Functions. Activity Functions are simple stateless single-purpose building blocks that do just one task and have no awareness of the bigger workflow. A new trigger type, ActivityTrigger, was introduced to expose functions as workflow steps, as I explain below. It has a common FunctionName attribute to expose the C# static method as an Azure Function named BookConference. The name is important because it is used to invoke the activity from orchestrators. The ActivityTrigger attribute defines the trigger type and points to the input parameter conference which the activity expects to get for each invocation. The function can return a result of any serializable type; my sample function returns a simple property bag called ConfTicket. Activity Functions can do pretty much anything: call other services, load and save data from/to databases, and use any .NET libraries. 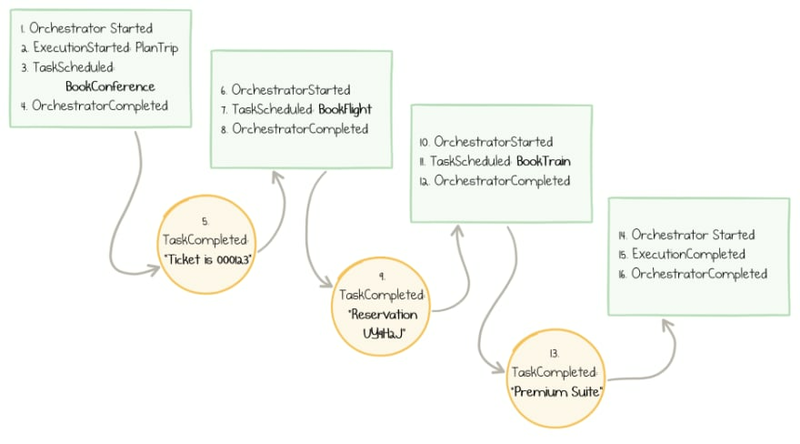 The Orchestrator Function is a unique concept introduced by Durable Functions. Its sole purpose is to manage the flow of execution and data among several activity functions. Again, attributes are used to describe the function for the Azure runtime. The only input parameter has type DurableOrchestrationContext. This context is the tool that enables the orchestration operations. In particular, the CallActivityAsync method is used three times to invoke three activities one after the other. The method body looks very typical for any C# code working with a Task-based API. However, the behavior is entirely different. Let's have a look at the implementation details. Let's walk through the lifecycle of one execution of the sequential workflow above. When the orchestrator starts running, the first CallActivityAsync invocation is made to book the conference ticket. What actually happens here is that a queue message is sent from the orchestrator to the activity function. When the message arrives, the orchestrator gets triggered again and can proceed to the secondactivity. The cycle repeats—a message gets sent to Book Flight activity, it gets triggered, does its job, and sends a message back to the orchestrator. The same message flow happens for the third call. As discussed earlier, message passing is intended to decouple the sender and receiver in time. For every message in the scenario above, no immediate response is expected. On the C# level, when the await operator is executed, the code doesn't block the execution of the whole orchestrator. Instead, it just quits: the orchestrator stops being active and its current step completes. Whenever a return message arrives from an activity, the orchestrator code restarts. It always starts with the first line. Yes, this means that the same line is executed multiple times: up to the number of messages to the orchestrator. However, the orchestrator stores the history of its past executions in Azure Storage, so the effect of the second pass of the first line is different: instead of sending a message to the activity it already knows the result of that activity, so await returns this result back and assigns it to the conference variable. Because of these "replays", the orchestrator's implementation has to be deterministic: don't use DateTime.Now, random numbers or multi-thread operations; more details here. Azure Functions are stateless, while workflows require a state to keep track of their progress. Every time a new action towards the workflow's execution happens, the framework automatically records an event in table storage. Whenever an orchestrator restarts the execution because a new message arrives from its activity, it loads the complete history of this particular execution from storage. Durable Context uses this history to make decisions whether to call the activity or return the previously stored result. Observability—no history is ever lost, so it's straightforward to inspect and analyze even after the workflow is complete. Azure Functions on the serverless consumption-based plan are billed per execution + per duration of execution. The stop-replay behavior of durable orchestrators causes the single workflow "instance" to execute the same orchestrator function multiple times. This also means paying for several short executions. However, the total bill usually ends up being much lower compared to the potential cost of blocking synchronous calls to activities. The price of 5 executions of 100 ms each is significantly lower than the cost of 1 execution of 30 seconds. By the way, the first million executions per month are at no charge, so many scenarios incur no cost at all from Azure Functions service. Another cost component to keep in mind is Azure Storage. Queues and Tables that are used behind the scenes are charged to the end customer. In my experience, this charge remains close to zero for low- to medium-load applications. Beware of unintentional eternal loops or indefinite recursive fan-outs in your orchestrators. Those can get expensive if you leave them out of control. This situation is expected by Durable Functions. Instead of silently failing, the activity function sends a message containing the information about the error back to the orchestrator. 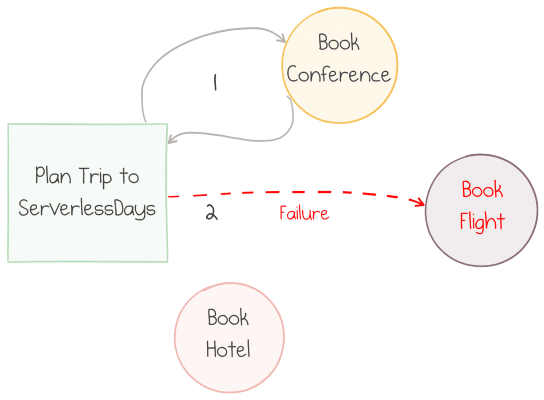 The code above falls back to a "backup plan" of booking another itinerary. Another typical pattern would be to run a compensating activity to cancel the effects of any previous actions (un-book the conference in our case) and leave the system in a clean state. The significant point is that, once again, the orchestrator does not block while awaiting retries. After a failed call, a message is scheduled for the moment in the future to re-run the orchestrator and retry the call. The code above books two conferences, one after the other. What if we want to run multiple activities in parallel? 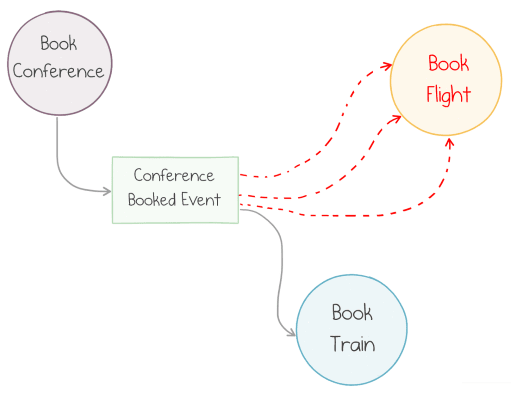 In this scenario, the BookTrip orchestrator accepts an input parameter with the name of the conference and returns the expense information. ReportExpenses needs to receive both expenses combined. Remember that awaiting the WhenAll method doesn't synchronously block the orchestrator. It quits the first time and then restarts two times on reply messages received from activities. The first restart quits again, and only the second restart makes it past the await. Task.WhenAll returns an array of results (one result per each input task), which is then passed to the reporting activity. Another example of parallelization could be a workflow sending e-mails to hundreds of recipients. Such fan-out wouldn't be hard with normal queue-triggered functions: simply send hundreds of messages. However, combining the results, if required for the next step of the workflow, is quite challenging. Making hundreds of roundtrips to activities and back could cause numerous replays of the orchestrator. As an optimization, if multiple activity functions complete around the same time, the orchestrator may internally process several messages as a batch and restart the orchestrator function only once per batch. Waiting for the first completed task in a collection (rather than all of them) using the Task.WhenAny method. Useful for scenarios like timeouts or competing actions. Pausing the workflow for a given period or until a deadline. 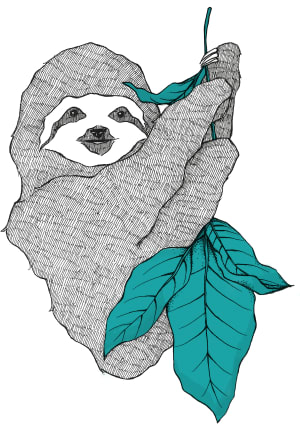 Waiting for external events, e.g., bringing human interaction into the workflow. 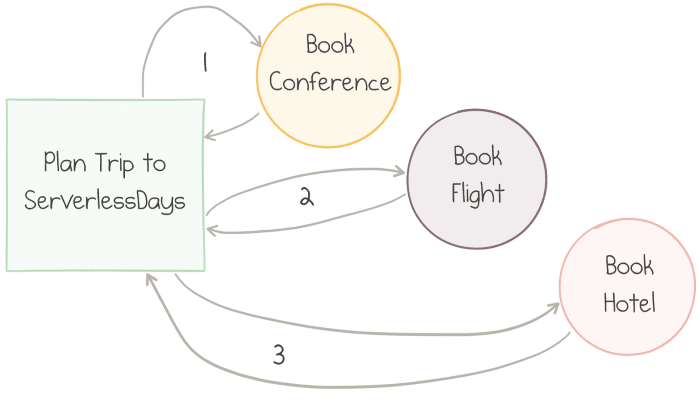 Running recurring workflows, when the flow repeats until a certain condition is met. Further explanation and code samples are in the docs. I firmly believe that serverless applications utilizing a broad range of managed cloud services are highly beneficial to many companies, due to both rapid development process and the properly aligned billing model. Serverless tech is still young; more high-level architectural patterns need to emerge to enable expressive and composable implementations of large business systems. Azure Durable Functions suggests some of the possible answers. It combines the clarity and readability of sequential RPC-style code with the power and resilience of event-driven architecture. The documentation for Durable Functions is excellent, with plenty of examples and how-to guides. Learn it, try it for your real-life scenarios, and let me know your opinion—I'm excited about the serverless future! Many thanks to Katy Shimizu, Chris Gillum, Eric Fleming, KJ Jones, William Liebenberg, Andrea Tosato for reviewing the draft of this article and their valuable contributions and suggestions. The community around Azure Functions and Durable Functions is superb!